Solar power systems, or PhotoVoltaic (PV) Systems, can be broadly classified into two main, extensive categories. One of them is known as an On-Grid (Solar) System, more commonly referred to as Grid-Tied Solar systems, while the other is known as Off-Grid (Solar) Systems. What are the benefits of off-grid and grid-tied systems? Which option suits you best? Understanding the key differences between these solar system types is a must before having a solar system installed at your home, business or remote location. Depending on your budget, your goals for energy and the environment, you will be able to determine which type is the best for you. However, it is advisable to talk your goals through with your solar contractor to accurately weigh down all possible options and understand the estimated costs of each option. These are solar systems that are connected to the utility power grid and require the grid to be running to function. These systems are also known as on-grid, grid-direct, grid-intertie, utility-interactive, and grid back-feeding. It is ideal if you lack adequate spacing or the required budget to install a solar system that covers 100% of your electricity usage hence you can use electricity from the grid whenever you need. It requires a lower initial investment as you won’t need to batteries or other stand-alone equipment for a fully functional off-grid, as well as the associated costs of maintenance. Energy produced by the solar grid is often more than the energy that you are capable of consuming. Net metering allows you to sell any excedent electricity generated on the grid rather than storing it in batteries in the form of Solar Renewable Energy Credits (SRECs). These schemes, thereby, play a significant role in incentivizing solar energy. Many organizations commit to buying electricity from homeowners with the excedent electricity being sold to them at the same rate as they sell it. Net meters, hence, make solar systems at your residence more feasible from a financial standpoint. The electricity generated from these solar systems can also be used to offset utility electricity during off-weather days such as cloudy, rainy/stormy days, owing to the concept of net metering. The utility grid in many ways acts as virtual battery storage, by offering relatively more efficient rates (compared to batteries) and the fact that they require no maintenance or replacements. According to Us Energy Information Administration, electrical energy stored in the form of chemical, typically lead batteries are only 80% efficient, with degrading performance over time. Hence, the use of grid brings in a valuable incentive compared to conventional battery systems. This system offers access to backup electricity in case there is the hindrance in the generation of electricity for any particular reason. Inverters are implemented to regulate the voltage and current received from your solar panels. Micro-inverters happen to be an ideal option for homeowners who reckon of the possibility of shading issues. These are placed on the back side of the solar panels as opposed to inverters that centrally over the entire solar array. Grid-tie Inverter (GTI) also known as grid-interactive or synchronous inverters, convert Direct Current form your solar panels to Alternating Current, which is more applicable to a wide variety of electrical appliances. Additionally, they concur the phase and frequency of the current to adhere to the utility grid frequency which about 60 Hz. To ensure that any excess electricity flows to the grid, the output voltage of the GTI Is usually adjusted higher than the utility grid. This device, also known as a net meter or a two-way meter, is capable of measuring power going in both directions, from the grid to your house and your house to the grid. Homeowners using this solar system need to make use of a power meter that caters to net-metering. Off-Grid Solar Systems are a better option for you if you wish to install a solar system that is independent of the electrical grid. This solar system needs its solar panels to cater to 100% energy demand of the platform it is installed in and hence need to be large enough to suffice energy needs. Most residential platforms demand higher electricity in the later part of the day; therefore excess energy produced during the daytime needs to be stored to meet the demands of the electrical usage in the evening. Off-Grid solar systems usually incorporate a backup source of energy such as a generator or battery to store excess energy or both. These solar systems are more complex and less flexible than on-grid systems. Off-grid systems are more applicable and common in remote locations without utility service. As there are no source grids to provide excess power, the electrical energy usage must be monitored religiously and adjusted below maximum power output, in all off-grid frameworks. These systems demand stand-alone equipment and battery banks that must be replaced within 10 years of use. The net amount for maintenance and replacement makes this system relatively costly and inefficient. Off-Grid Solar systems have their own set of advantages which makes them popular and beneficial. Off-grid solar systems are often substantially cheaper than utility grid in remote areas. Having your source of electrical power sets you free you and relieves you of any inconveniences from utility grid power failures. It also serves as a form of security. However, it is advised to maintain battery backups for cloudy/dark days. Group of batteries wired together to keep the system running beyond daily sunset. It forms the most complex and costly part of the solar system, but it is also the most important. An appropriate size of the battery bank is critical since too many batteries can lead the system to never charging to its full capacity. This is to protect the battery from overcharging. These are crucial as battery regulation extends battery life and ultimately increases system efficiency via reduced overall costs. Conversion of direct current to analog current is necessary to make electricity eligible for most electrical appliances. A third, trending option resides with combining the best from grid-tied and off-grid solar systems. Grid-tied solar systems are upgraded with deep battery backup that will be charged via solar panels as well as from the grid. The battery can be set to take over in case of an outage automatically. 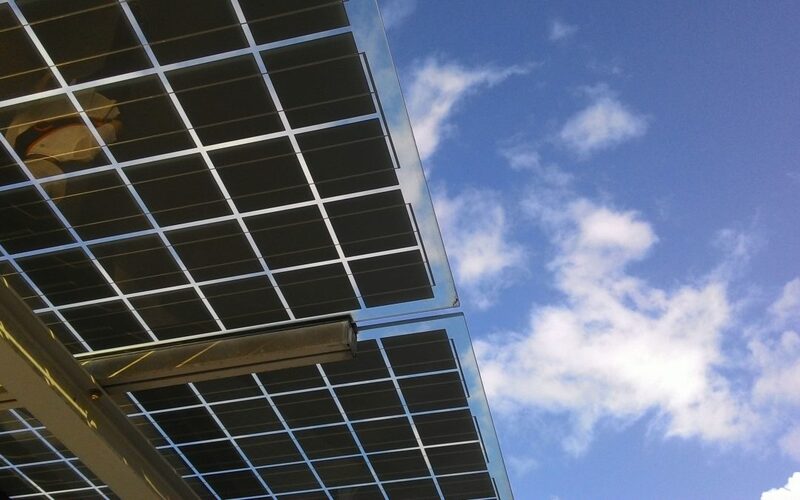 In case your decision to take one further step to live an off the grid life is taken and your new solar system is soon to become a reality, ecofriendly.solutions will be pleased to recommend you to the best and most suitable service providers for your needs. Fill up the form below and let one of our trusted service providers contact you. No commitments! Lets Live a Green Life! Join our mailing list to receive our latest articles and news about environmental protection and sustainability. We’re an Amazon associate powered website that brings you the best eco-friendly solutions and related products from across Amazon. You will receive no more than one email per week, and you can opt out at any moment.